17. BONUS TRACK; New York, October 1957. 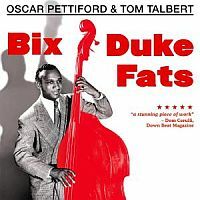 This CD contains the complete tribute albums Bix, Duke, Fats and Basically Duke, which are similar in concept, material, style, format and personnel. With the addition of the bonus track “Not So Sleepy”, this release compiles all of Oscar Pettiford’s nonet recordings as a leader.